I swear, it only seems like a month or so ago since I was typing a blog to let you know about the new CD, "Booze, Bluez, & BBQ: Live In Tupelo." It's hard to believe it's actually been a year, and what a year it's been! I never, in my wildest dreams, thought it would be as well received as it has been. We do this thing because of our love of the music, and it makes it easier to continue knowing there are others just like us out there. Thank you so much for supporting us in this endeavor. It means the world to us. I'm guessing it would also probably be good business at this point for me to let you all in on a little secret. Are you ready? Here it goes. It's that time of year again! My Annual Birthday Bash. 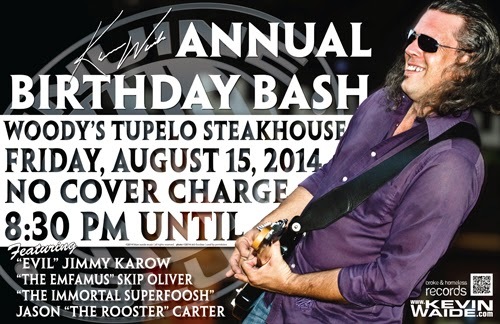 A six year tradition, this year (as last year) we will be at Woody's Tupelo Steakhouse in Tupelo, Mississippi. It's my 42nd birthday, and since I don't have an album to release this year (yet) I started looking for ways to make it special. Look at that lineup on the poster. Do you recognize any of those names? Yup, it's the ORIGINAL LINEUP! "Evil" Jimmy Karow and Foosh will be keeping the groove flowing right along. "The Rooster" Jason Carter will be playing guitar alongside "The Emfamus" Skip Oliver on the blues harp! I gotta say, I'm so excited about this it's been damn near impossible to keep to myself. And, even better, there will be NO COVER CHARGE!!! How can we afford to do this? We can't, but that's never stopped us before. Go ahead and mark your calendar now. Get there early if you want to get in. The celebration starts at 8:30 and will go until they kick us out, I can promise you that. I'm sure there's something else I'm forgetting to say, so be sure to keep a check on the site at www.kevinwaide.com or on Facebook or Twitter for any other news. And if you haven't signed up for the Mailing List on the site, you're really missing out on exclusive content only available to subscribers. The signup form is just to the left of the Featured Video section on the homepage, so drop on by and sign up. Me love you long time!